In August 2010, Thomas “T” Vincent Simpson, stepped foot on the Cowley College campus determined to earn his associates degree. Over the next few years, and a couple of major changes later, he graduated with an associate’s degree in Computer Science. After Cowley, “T” transferred on to Wichita State University where he began a program in Aero Space Engineering. He was off to a successful start at WSU, but on October 29, after a lengthy and courageous battle with cancer, sadly passed away. 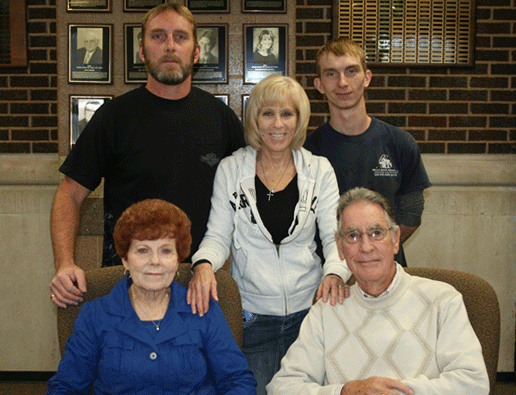 His grandparents, Marvin and Anita McCorgary, reached out to the Cowley College Foundation and has established the Thomas Vincent Simpson Memorial Scholarship; a scholarship that will provide assistance to Ark City High School graduates majoring in a computer related field. “I had the joy to work with “T” as his academic advisor when he was a student at Cowley” Ben Schears Vice President for Institutional Advancement said. “It’s a remarkable way to honor and remember the life of a fine young man whose time on this earth was far too short”. Those pictured are, front row from left, Anita McCorgary and Marvin McCorgary. And back row from left, Shane Frederick, Alisa Frederick, and Mike Frederick.